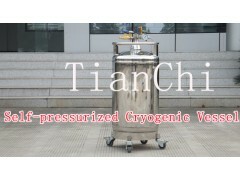 Over the years, the company fully utilized the key technology and advantages of the war industry and developed many kinds of cryogenic vessels with different specifications, which are widely used in the fields of spaceflight and aviation, medical treatment, biology and stock breeding. (1). If there being any leakage phenomena in the joints such as valves and so on, it may caused because of the non-tight compression nut seal to the valve or the damaged gasket; it shall be screwed tightly by using the spanner or the gasket shall be replaced. (2). The ice blocking phenomenon may be occurred generally in the pressurization coil and sometimes may be occurred in the liquid discharging pipe because the moisture in the entering air may not be discharged fully and be condensed into ice under the low temperature so as to block the pipe; the corresponding solution may be to use the nitrogen cylinder (or the compressed air cylinder) at first to fill the vessel with nitrogen (or compressed air) through the relief valve; while the vessel internal pressure is increased to 0.05-0.09MPa, the liquid medium in the vessel shall be emptied (if the liquid supply pipeline is jammed, the liquid shall be discharged from the front end of the pressure increasing valve; If the pressure increasing pipeline is jammed, the liquid shall be discharged from the liquid supply pipe); then the hot nitrogen or the dry heated air may be used to purge the ice-blocking pipeline to blow out ice; then all valves shall be switched off. No matter you are supplier, end user or purchaser, we can provide you the best price and excellent products to meet your satisfaction perfectly.